Allseating Chiroform, High Back, 24 Hour Chair  - Free Shipping! The Chiroform chair from Allseating was designed with strength that lasts the tests of time. Ideal for task-intensive environments. 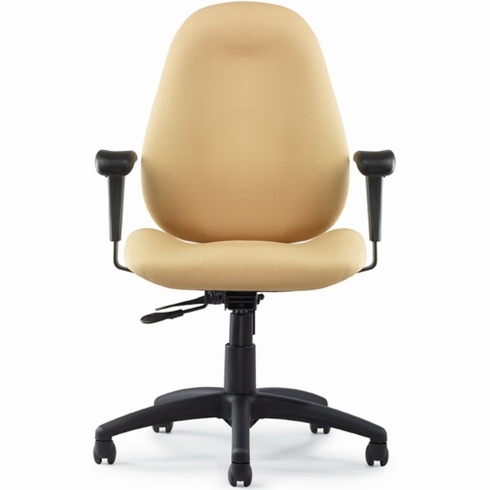 The fully contoured, double-curve backrest offers superb lumbar support. Other features include high density molded foam seat and backrest cushions, 6 ply Canadian maple seat pan, pneumatic seat height adjustment, 360-degree swivel, backrest height adjustment, backrest angle adjustment and a heavy duty five star nylon base with dual wheel carpet casters. Additional caster options available. The Chiroform chair meets or exceeds ANSI/BIFMA standards. Dimensions: Seat Size: 21"W x 18.5"D. Back Size: 19"W x 22" - 26.5"H. Seat Height Adjustment: 16.5" -21.5"H. Overall: 38.5" - 48"H x 28"W x 28"D. 10 year warranty from Allseating. This chair normally ships within 3-4 business days from Toronto CA.